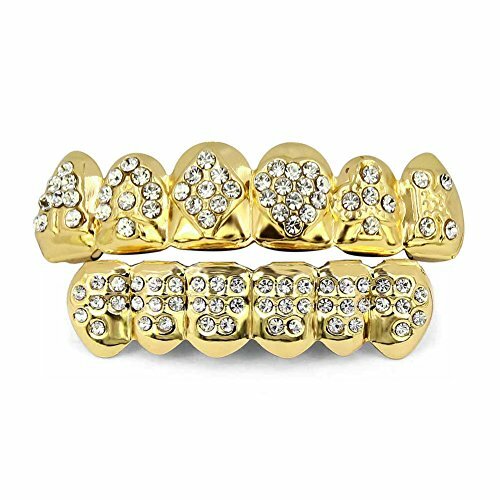 Black Plated Grillz Set Top Upper And Bottom Lower Teeth Hip Hop Mouth GrillsCategory: Mouth GrillzGet your bling on with these stylish all-black hip hop grillz set for top and bottom teeth. Quick and easy to fit in five minutes. 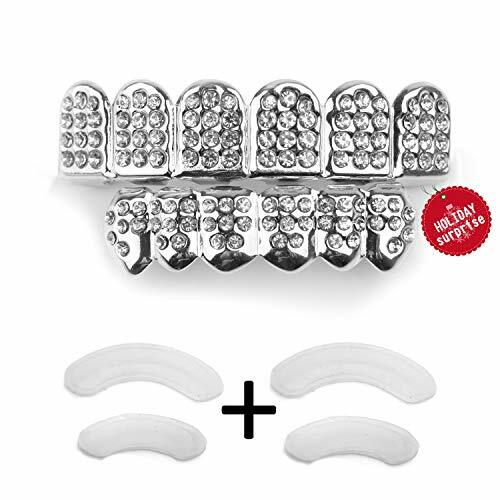 Removable and reusable instant bling teeth grills. Great for parties, shoots, clubbing, etc. Beautiful black plated finish for an intriguing shine. 14k Gold Plated Drip Fang Grillz Dripping Bottom Vampire Teeth Fangs Grill Hip Hop Mouth GrillsCategory: Mouth GrillzStylish drip vampire fang grillz for the bottom teeth. Quick and easy to fit in five minutes. Removable and reusable pre-made teeth grills. Great for parties, shoots, clubbing, etc. Beautiful gold plated finish for a dazzling shine. 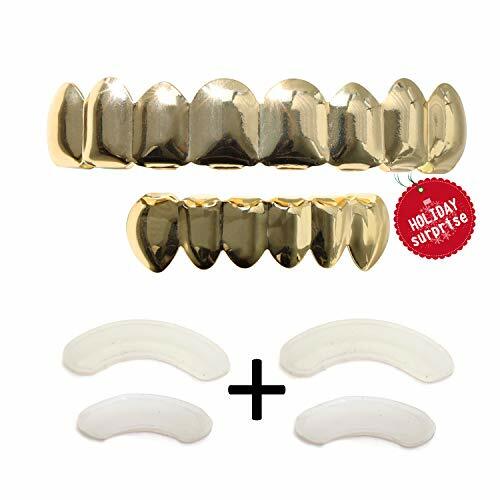 Mouth Grills 14k Yellow Gold Plated Tops and Bottoms SetCategory: Mouth GrillzOne Size Fits All - Fits To Any Mouth Size, Even Crooked Teeth Instructions Are Included for Easy Molding Within Minutes. 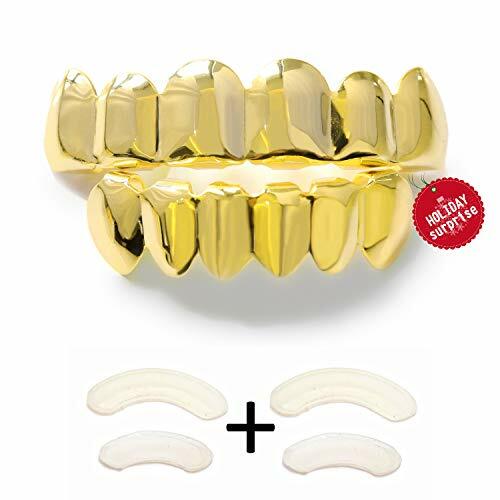 Includes Resizable Silicone Molding Bars For Custom Fitting Attention: Please keep in mind that this item is NOT real gold Set Contains Grillz For Both Upper & Lower TeethEasy to Wear. Fun accessory. Shine and stand out from the rest! 14k Rose Gold Plated Drip Fang Grillz Dripping Bottom Vampire Teeth Fangs Grill Hip Hop Mouth GrillsCategory: Mouth GrillzStylish drip vampire fang grillz for the bottom teeth. Quick and easy to fit in five minutes. Removable and reusable pre-made teeth grills. Great for parties, shoots, clubbing, etc. Beautiful rose gold plated finish for a dazzling shine. 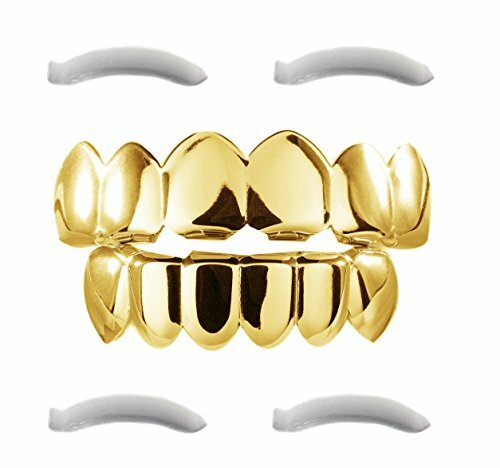 Grillz Teeth for Hip Hop Cool Mouth Grill Funny Top Bottom Custom Gold Plated Tooth Cap SetCategory: Mouth GrillzThis custom Hip Hop Gold Grillz Teeth is the perfect fashion accessory to people whom want show your own unique. Our Silicon Molding Bars custom fit to the most people's mouth, you can easy to install the mouth grillz caps teeth!SizeTop: 5*1.4CMBottom: 4*1.1CMInstructions1. These Grillz are intended for entertainment purpose only.2. 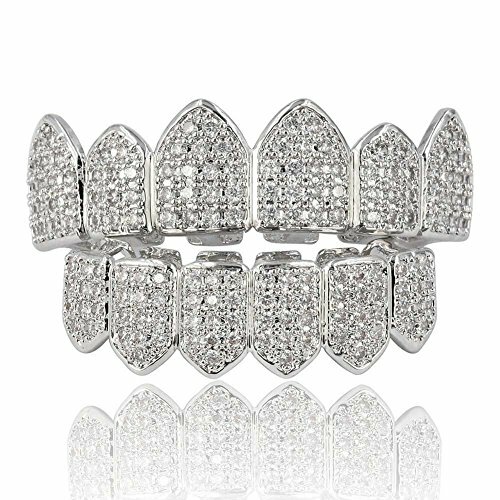 Grillz should not be worn continuously.3. They are not intended for eating, sleeping, or for the replacement of natural teeth or broken fillings.4. You should clean grillz in cold water and dry after used then store it in the box supplied.5. Do not use slovent for cleaning.6. Do not eat fixing bar (silicon), grillz and decorative stone on Grillz.7. Do not use the fixing bar over 180F.8. Be careful of the discoloration. 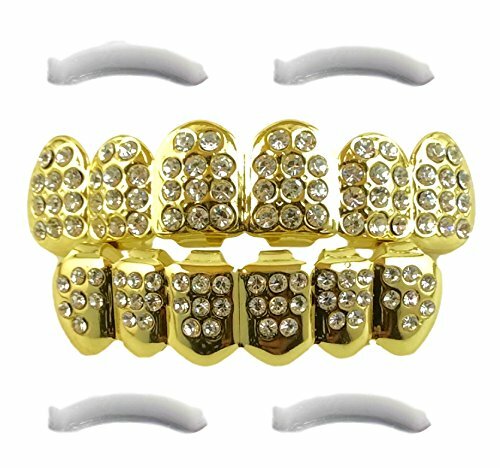 It may change the color when chemical materials such as hair care product, nail care product and skin care product are touched.Package Include2 X Golden Grillz (Top & Bottom)2 X Silicon Molding Bars1 X User ManualNote-Please remove it when you eating, sleeping.-Due to the different of light and screen, the product may be slightly different from the photograph.-Please follow the instruction page in package before you use it. 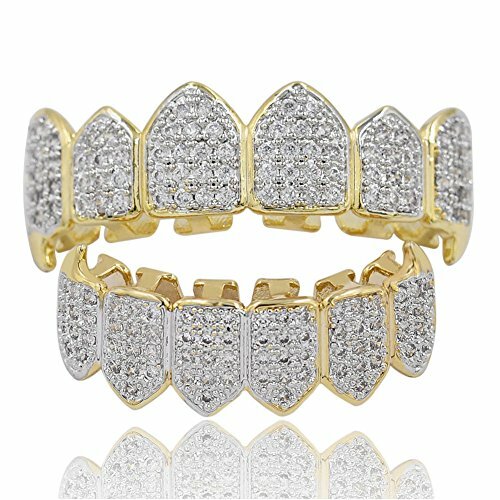 14k Gold Plated Micro Pave Grillz Iced-Out Top Upper Teeth Micropave Mouth GrillsCategory: Mouth GrillzGet your bling on with these stylish micro-pave hip hop grillz for upper teeth. Quick and easy to fit in five minutes. 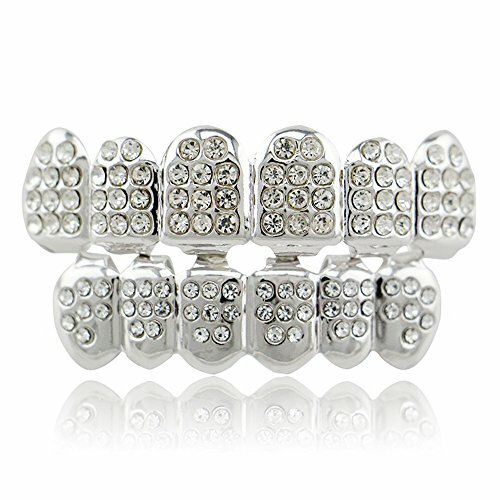 Removable and reusable instant bling teeth grills. Great for parties, shoots, clubbing, etc. 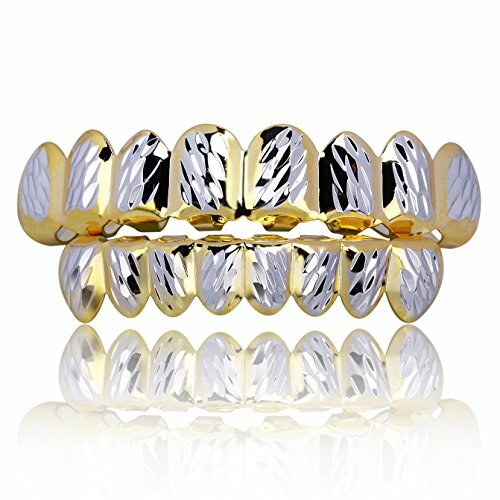 Beautiful gold plated finish over brass metal for a dazzling bling shine. 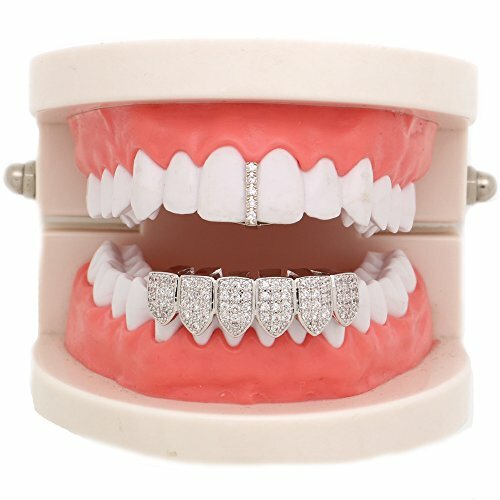 Grillz Diamond-Cut Bling Grill Top Upper Six 6 Teeth Silver Tone Hip Hop Mouth GrillsCategory: Mouth GrillzGet your bling on with this stunning diamond-cut grillz set for top teeth. Quick and easy to fit in five minutes. Removable and reusable pre-made teeth grills. Great for parties, shoots, clubbing, etc. Beautiful rhodium plated finish for a dazzling shine. 14k Gold Plated Grillz Dollar Signs $ Cash Money Top Mouth Grill Hip Hop Teeth GrillsCategory: Mouth GrillzGet your shine on with this embossed dollar signs grillz for top teeth. Quick and easy to fit in five minutes. Removable and reusable instant teeth grills. Great for parties, shoots, clubbing, etc. Beautiful gold plated finish for a dazzling shine. 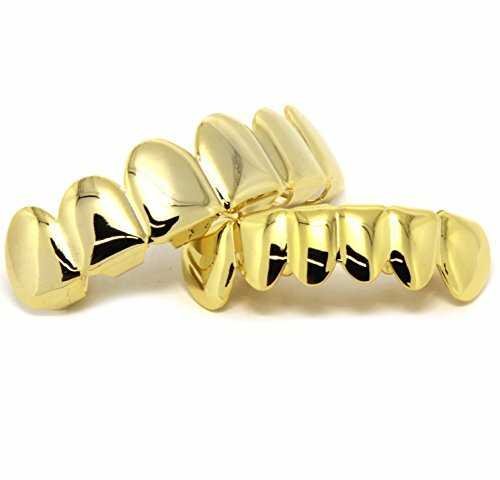 14k Gold Plated Grillz 8 Top Teeth Fangs Eight PC Hip Hop Vampire Mouth Fang GrillsCategory: Mouth GrillzGet your shine on with these eight tooth vampire fang grillz for top teeth. Quick and easy to fit in five minutes. Removable and reusable instant teeth grills. Great for parties, shoots, clubbing, etc. Brilliant gold plated finish for a dazzling shine.